Auto-Magic filter for internal use on digital Compact camera housings. The AM is a 50x50mm gel sheet of Auto-Magic filter and is intended for use inside your underwater housing. You can either mount it onto the lens of the camera or onto the inside of the housing's port (see below). As a result the filter is in place for the entire dive. 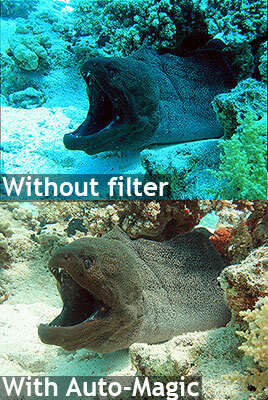 See this page for more details on how to cut and fix the filter. 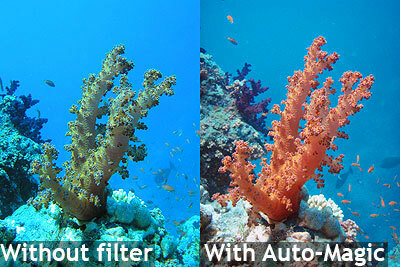 Please note that the Auto-Magic filter is also available as a solid filter for external mounting on your underwater camera. Both filters use the same filter recipe. A single AM1 costs £22 and a pack of three filters (AM3) costs £35. Sample before and after photos with the AM1 on a digital compact camera.